Now that you’ve completed all the material related to Chapters 7, 8, and 9 of your textbook, you’re ready to complete Graded Project 3. For this graded project, you’ll use many of the C# skills you’ve learned thus far. Follow all the instructions for this graded project, and follow good programming practices as you create your solution. Remember to include all the required components when you submit your solution. To finish this graded project, you must complete a number of tasks to create the necessary solution. In this graded project, you’ll create a class named TaxCalculation.cs as outlined in Exercise 5a on page 350 of your textbook. Note: To complete this graded project, use a text editor or use Microsoft Visual C# software. The figures included in this graded project show the steps involved when using the Visual C# integrated development environment (IDE). The IDE adds extra code, so if you choose to create your program using a text editor instead of the IDE, the code may be slightly different. Remember: Always run your program after you complete the code to make sure it works appropriately. 1. Start a new C# project named TaxCalculation.cs. 2. Save the TaxCalculation.cs program in the Chapter.08 folder of your Student files (Figure 7). 3. 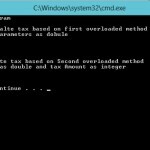 Create a class named TaxCalculation. 5. 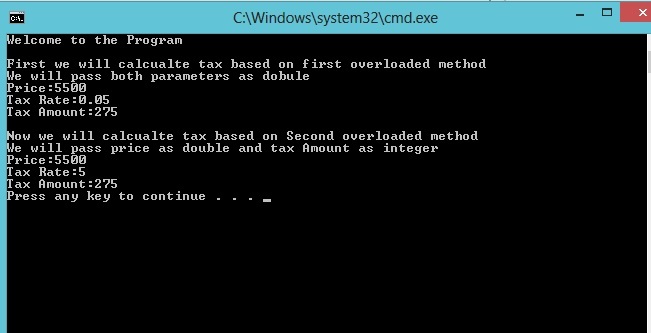 Include a Main() method that demonstrates how each method calculates the same tax amount appropriately. Refer to pp. 329–331 in your textbook. 7. Now build your program by selecting Build from the menu bar (Figure 8). Your program will automatically build. Any errors that could occur in the code will typically be shown at the bottom of your screen. 8. After you’ve built your program, test your program by selecting Debug > Start Debugging from the menu bar (Figure 9). Your program will execute and display results. If any errors occur during the execution of your program, you’ll be prompted and taken back to your code so you can make corrections. 9. If necessary, repeat Steps 7 and 8 until your program works as intended. 1. Log in to view your student homepage and go to the My Courses page. 2. Click Take Exam next to the lesson on which you’re working. 3. Attach your file as follows by following steps a–d. e. If you have more than one file to attach, repeat steps a–d for each file. 5. If you wish to include comments about this project to your instructor, enter your comments in the Message box.